Sock Puppet Nation - Join the Nation! If you do not have a subscription with i-SAFE yet, there is still plenty of fun, free stuff to do here. You will have an opportunity to join the very fun and silly world of other sock puppets. Why sock puppets? First of all, they’re adorable … and secondly, it allows you to socialize online in a safe manner when communicating through your puppets. Sock Puppets are easy to make and are a real world, organic version of avatars that you may have already used on other sites. Currently, our impressionable cotton hosts have no names. Why? Because we need students to help create the “Sock Puppet Nation”. 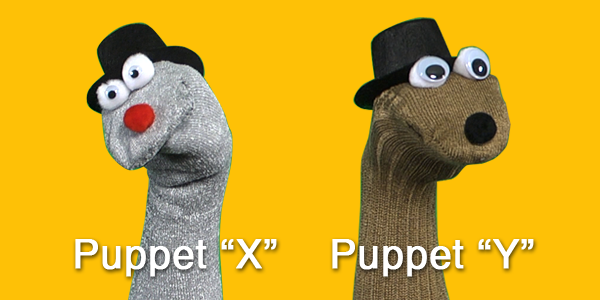 For right now, we’ll call them Puppet “X” and Puppet “Y”. Puppet “X” is a wise-cracking, fast talking, figure head for the “Sock Puppet Nation”. He bounces his wit off the more slowly moving, but lovable sidekick, Puppet “Y.” The dichotomy of the two characters sets up a fun way to teach students about e-SAFETY topics. Downloadable print material, cartoons, videos, and more!